Choosing your dress is not just an experience for you, it’s an experience for your friends and family! Gather your girls (and guys) and make a day of it! We have a few different appointment types to ensure you have the chance to enjoy the process of finding your dress! Weekend morning appointments with a mimosa bar and catered brunch for you and your guests! A private weekend appointment with our salon all to yourself! 2 stylists to assist in finding the dress. Oh, and champagne and cheese for you and your guests! Our classic 90 minute appointment at our beautifully updated salon with a personal stylist to help you find your dream dress from over 1300 gowns and over 25 of the top bridal gown designers! 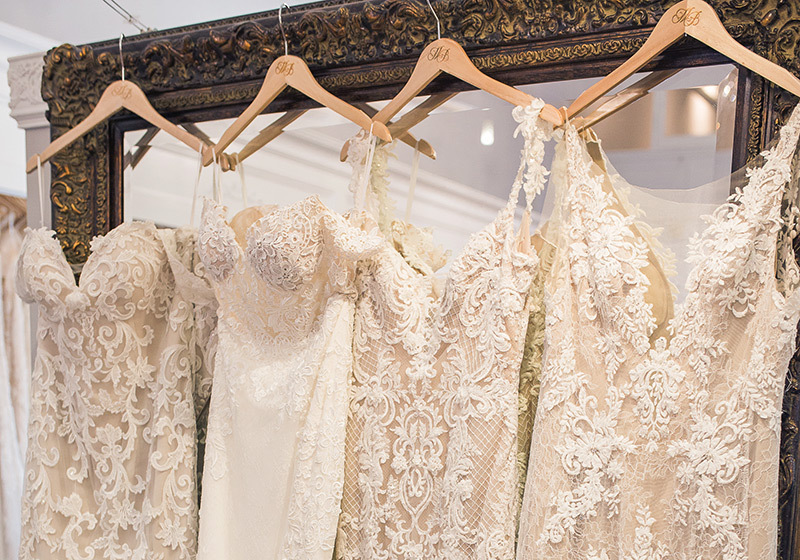 We Believe That Each Bride Has "The" Dress They Were Meant To Wear. Our Job Is To Find It. Here Are Some Helpful Tips And Guidelines To Make Shopping For A Wedding Dress An Experience To Remember. One of the most important things to know before searching for your dress is your wedding date. It typically takes 6 months to get your wedding dress in, so plan accordingly! If your date is closer than 6 months away, don't panic yet: you always have options. YOU DON'T HAVE TO BE AN EXPERT! Don't worry if you aren't sure what type of dress you're looking for. Once you book your appointment with Miosa you will receive a web link to your individual Bridal Portal, which gives you access to view our entire collection of gowns, veils, and accessories. This portal also gives you the ability to sort the collections by price range and style as well as send direct notes about the dresses and details you like for each dress to better help your stylist choose dresses that match your style! Determining your price range is essential before you are able to find your dress. Our consultants will always respect and work within your budget. We have a vast selection of gowns to choose from for all price points. Schedule an appointment with us today to start the process of finding your dream dress!